KARACHI: A movement demanding rights for Pakistan’s ethnic Pashtun minority has staged its first rally in the southern seaport city of Karachi. The Pashtun Tahafuz Movement (PTM) or Pashtun Protection Movement emerged after the January killing by police of Pashtun youth Naqibullah Mehsud in Karachi. 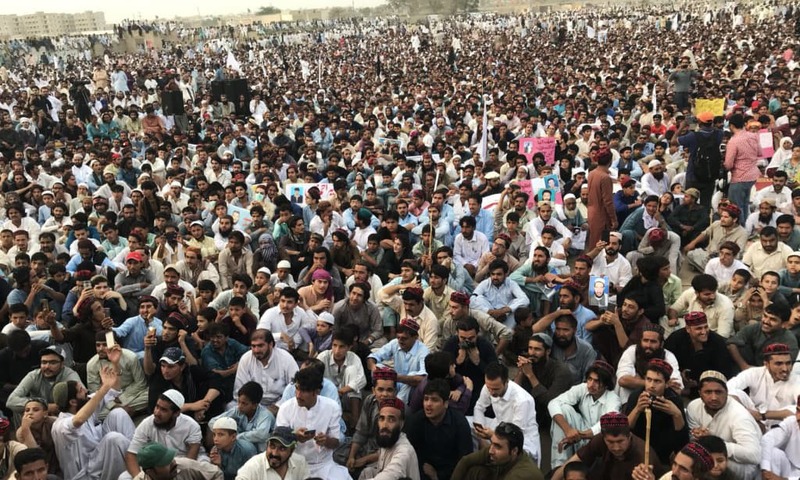 On May 13, a crowd of several thousand people gathered in Karachi’s outlying Sohrab Goth suburb to welcome Manzoor Pashtun, the PTM leader. Addressing the charged crowd, Pashteen denounced the extrajudicial killings and enforced disappearances in Karachi and across the country. He also reiterated the PTM’s demand for ‘Truth and Reconciliation Commission’ for addressal the grievances of the Pashtun community instead of all sorts of jirgas. “But if the government is still insistent on jirga then at least it can show some seriousness,” he added. He said it was difficult to comprehend why the PTM was stopped to hold rally in the metropolitan as there is a rally every day in the city. “Despite all the hurdles made in its way, the people have made the gathering successful,” he added. Alluding to Naqeebullah Mehsud’s extrajudicial murder, Pashteen said despite “suspended SPP Rao Anwar being labelled hero by the state, people have proved it otherwise.” After bringing Anwar to the task, the PTM will hold detained Ehsanullah Ehsan, the Taliban spokesperson, and former military dictator Pervez Musharraf responsible for the extrajudicial acts. “It all started with Musharraf,” he went on to add. The PTM has said several thousand such killings have been carried out since Pakistan joined the US-led war on terror and launched major military operations in 2009 and 2014 targeting Pakistani Taliban strongholds in the Pashtun majority Federally Administered Tribal Areas (FATA) areas bordering Afghanistan. Hundreds of thousands migrated to Karachi after the military operations, where the largest population of Pashtuns in Pakistan lives. Among the crowd of protesters were families of missing persons, holding pictures of their loved ones who they say were taken by security officials. The families say they have not received any information since the disappearances, some of them more than a decade ago. The PTM estimates there are over 5,000 such cases. “PTM was born out of the incident that happened in Karachi,” Mohsin Dawar, one of the group’s founders, told Reuters. “The trauma and pain the Pashtuns of the FATA have experienced, the Pashtuns of Karachi have gone through a similar experience,” he said. Officials from Pakistan’s paramilitary Rangers, which are part of the security forces, did not respond to request for comment. The PTM leader Manzoor Ahmad Pashteen’s popularity has surged amongst Pashtun youth. Some of the protesters wore the red and black patterned hat, which has become Pashteen’s trademark, as they waited for him to arrive at the rally. But Pashteen did not board his flight from Islamabad to Karachi on the morning of May 12 and a representative of local airline Serene Air said his booking had been cancelled, Dawar said. A Serene Air representative was not immediately available for comment. Dawar said Pashteen and three other PTM leaders had started on the more than 20-hour drive from Islamabad to Karachi but they were stopped several times along the way. “He has been stopped and detained for hours several times,” Dawar said. Speakers at the rally said they would not leave until Pashteen arrived. “We demand that security officials themselves bring Manzoor Pashteen here before our rally ends,” PTM member Sana Ejaz said. After sunset, the protesters held up cellphone flashlights, refusing to move until Pashteen turned up. The PTM leader eventually joined the rally around mid-night and addressed his supporters. Earlier on Saturday, a private airline denied Pashteen the boarding pass for a Karachi-bound flight from Islamabad. Although those accompanying the PTM leader were given boarding passes, Pashteen was denied of one since his name was “not in the system” and that he was not cleared to board the flight. Pashteen had maintained that he travelled by road to Lahore to catch another flight from there, but alleged that he was prevented from reaching the airport through strict checking at a check-post near Lahore airport. Initially, the movement was to hold a rally at Karachi’s Jinnah Bagh on Sunday, a day after the PPP’s rally at the same venue. However, the authorities gave permission to the PTM to stage a rally at the ground near Al-Asif Square in Sohrab Goth. PTM office-bearers alleged on Saturday that five workers had been “taken away by law enforcers”. Besides, students, intellectuals and political activists gathered at the National Press Club in Islamabad to protest the alleged crackdown against PTM organisers and activists in Karachi ahead of the rally. 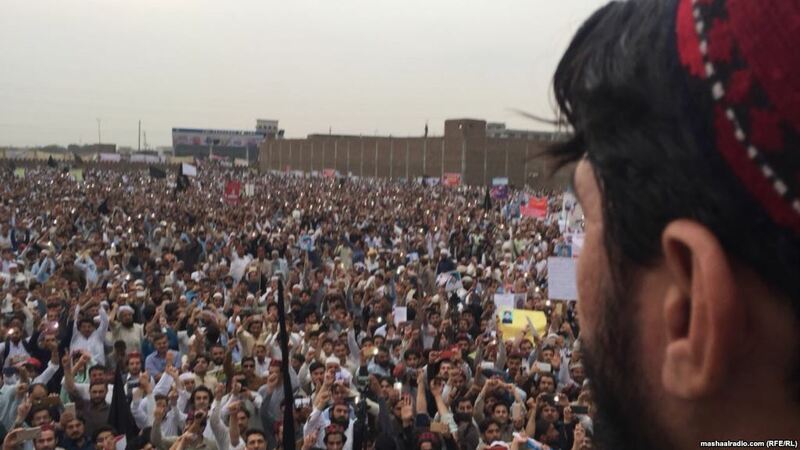 PTM activists have repeatedly expressed concern over what they said propaganda against the movement that it is creating uncertainty in the country and clarified that the main objective of the movement is to ensure equal rights to Pakhtuns across the country.